Steve Wallen Swim School has been teaching adult swim lessons for over 30 years to adult swimmers of all ability levels. Our experiences range from teaching swim lessons for adults with beginner to advanced skills as well as coaching competitive swimmers, including triathletes, collegiate and masters swimmers. 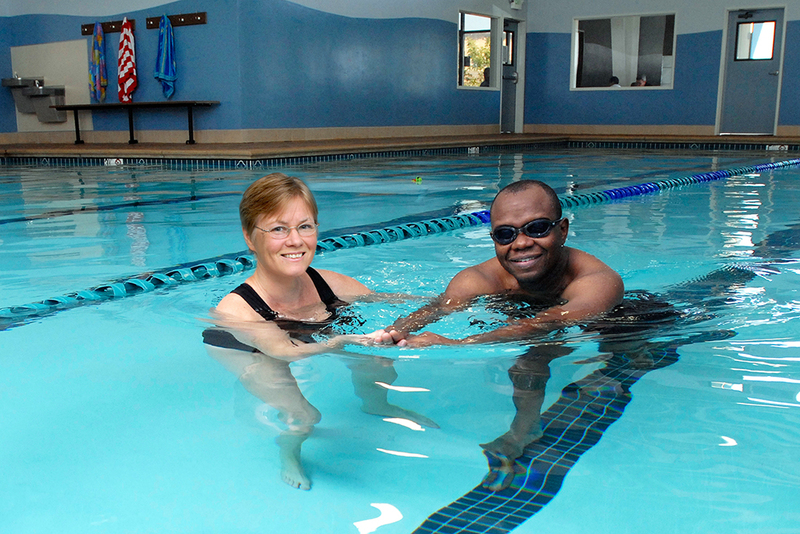 Our adult swim lessons are offered in private swim lessons, semi-private swim lessons, and group swim lessons. Our private swim lessons are offered in a 1:1 ratio and allow the largest opportunity for one-on-one interaction with one of our trained swim instructors in order to give students maximum attention and benefit. These classes are available Monday – Thursday from 9:00 am – 7:30 pm and Sunday 9:00 am – 1:00 pm with classes starting every half-hour. Our semi-private swim lessons are offered in a 2:1 ratio where we can match you up with another student if needed. We can also match adult swimmers up with one of their children or a partner, and additional family members receive a discount. Our class sizes are small, so we can match two students at different ability levels together and still work with each swimmer individually based on their current skill level. Approximately 15 minutes of 1:1 interaction, and when it is not their turn to swim with the instructor, they will be given a task to do based on their ability. These classes are available Monday – Thursday from 9:00 am – 7:30 pm and Sunday 9:00 am – 1:00 pm with classes starting every half-hour. Our group swim lessons are offered in a 3:1 ratio where we can match you up with two other students in class. These classes are available Monday – Thursday from 9:00 am – 7:30 pm and Sunday 9:00 am – 1:00 pm with classes starting every half-hour. Steve Wallen Swim School offers drop-in classes in private, semi-private, and group swim lessons which can be scheduled and paid for individually at the same rate per class. Drop-in swim lessons are the perfect option for students who cannot commit to a full session or simply need a few refresher classes to touch up on their skills. These classes are available Monday – Thursday from 9:00 am – 7:30 pm and Sunday 9:00 am – 1:00 pm with classes starting every half-hour.